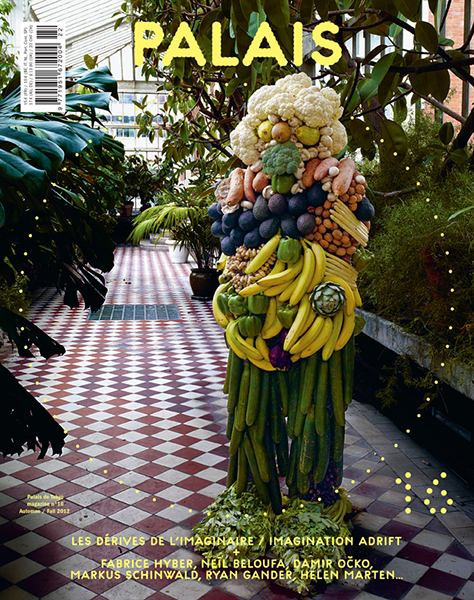 Published two times per year by the Palais de Tokyo, PALAIS magazine offers an in-depth perspective on the exhibitions and program of the Palais de Tokyo. 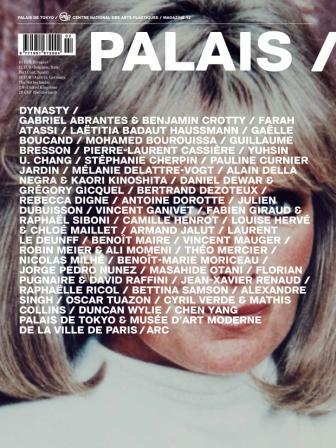 Each season, the magazine includes dossiers, interviews, essays, special projects and inserts, all contributed by artists, art critics, historians or theorists, making PALAIS magazine an essential tool for apprehending contemporary art. On the occasion of his carte blanche at the Palais de Tokyo (from 17 October 2018 to 6 January 2019), the artist Tomás Saraceno is the guest editor-in-chief of issue 28 of the magazine PALAIS. Tomás Saraceno’s exhibition ON AIR is an emerging ecosystem that hosts a choreography of multiple voices belonging to human and non-human universes and in which works reveal common, fragile and ephemeral rhythms and trajectories linking these worlds. ON AIR is comprised of the myriad presences, animate and inanimate, that meet and cohabit within it. As industrial extraction mines the Earth for resources, threatening entire ecologies, ON AIR celebrates new ways of thinking and new modes of knowledge production that point the way to a planet free of borders and fossil fuels. In so doing, the exhibition responds to the debate and global challenges posed by the Anthropocene, a word coined to define an epoch in which human activity leaves an impact so great that it profoundly modifies terrestrial ecosystems. 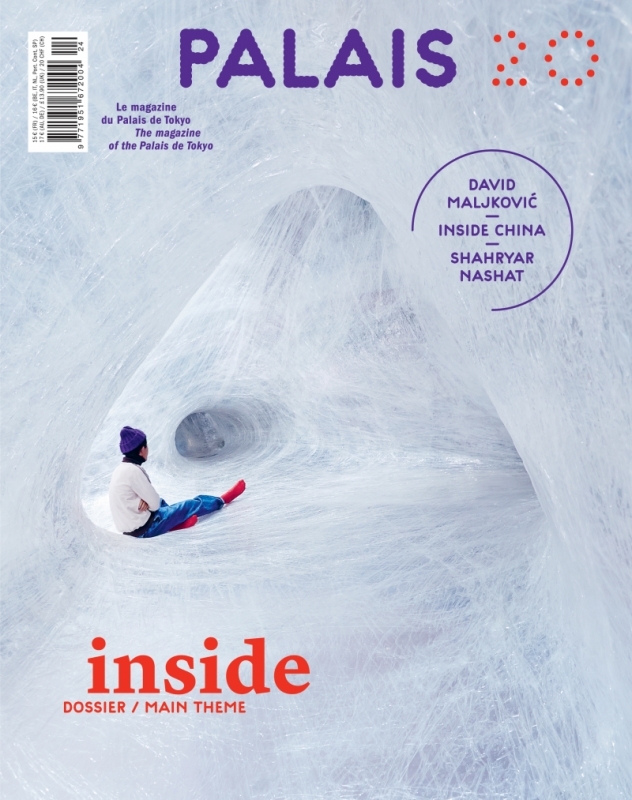 Reflecting Tomás Saraceno’s artistic practice and echoing his exhibition at the Palais de Tokyo, this issue of PALAIS magazine brings together a large variety of original contributions from philosophers, researchers, scientists, writers, curators, historians and theoreticians. With: texts by Benjamin H. Bratton, Vinciane Despret, Anselm Franke, Stavros Katsanevas, Brandon LaBelle, Bruno Latour, Megan Prelinger, João Ribas, Mark Wigley and Estelle Zhong Mengual; an interview of Tomás Saraceno by Rebecca Lamarche-Vadel, curator of the exhibition; the voices of Albert-László Barabási, Robert Barry, Markus J. Buehler, Luca Cerizza, Tim Choy, Christina Dunbar-Hester, Sasha Engelmann, Milovan Farronato, David Haskell, Jen Hauser, Peggy S. M. Hill, Caroline A. Jones, Leila W. Kinney, Eben Kirksey, Jonathan M. Ledgard, Sofia Lemos, Michael Marder, Derek McCormack, Roland Mühlethaler, Jussi Parikka, Andreas Philippopoulos-Mihalopoulos, Filipa Ramos, Nicholas Shapiro, Étienne Turpin and Philip Ursprung; as well as a large selection of images of Tomás Saraceno’s work. Palais Issue 28The product (Reference ) is not presently in stock. Sandra Adam-Couralet and Yoann Gourmel, the curators of the exhibition, present its challenges, between everyday spaces and dream territories, stupor and amazement. Kodama Kanazawa, the associate curator, examines the spatiotemporal hybridity of childhood. Special contributions from artists in the exhibition: Petrit Halilaj, Anna Hulačová, Chihiro Mori, Rachel Rose, as well as the artist and mangaka Yuichi Yokoyama who has produced an original manga about the figure of the chimera. The artist and curator Ydessa Hendeles takes an interest in the history of the teddy bear, as an important 20th-century figure. The linguist Aliyah Morgenstern and the sociologist Régine Sirota offer a selection of texts about the moments and rituals that make the stuff of childhood, with articles by Julie Delalande, Christine Détrez, Kevin Diter, Nicoletta Diasio, Nathalie Mangeard-Bloch and Virginie Vinel. The historian John R. Gillis analyses what he calls the “inslanding of children”: the separation in the modern era between the space for children and that for adults and the isolation of each child within its protective sphere. Ferdinand Cazalis retraces the history of playgrounds and brings out their anchorage in the political history of the West, from 1770 to today. 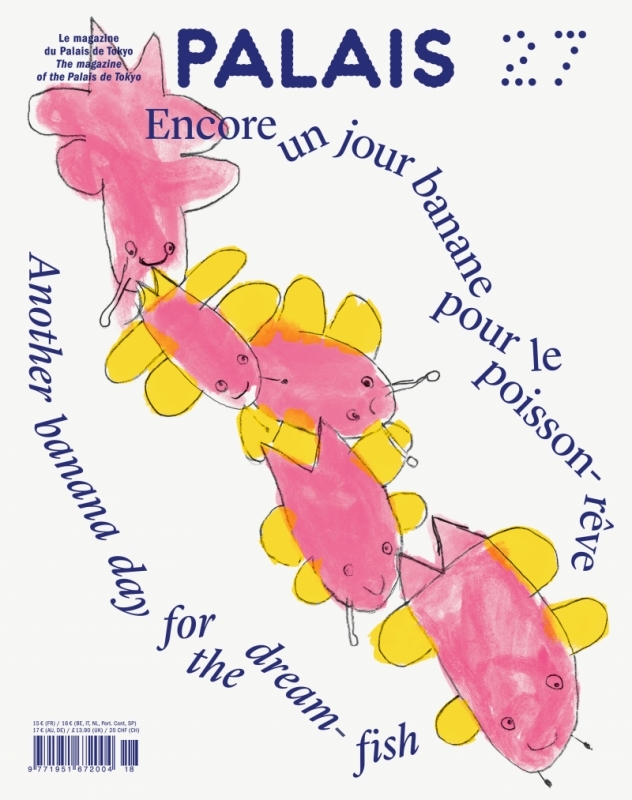 A selection of pieces produced by the pupils of the Torcy elementary school (Paris), who were invited to react to the exhibition “Another Banana Day for the Dream-Fish”, as part of an educational project with the Palais de Tokyo. In a special contribution, Clément Cogitore unveils the notebook for his dramaturgy of the exhibition “Another Banana Day for the Dream-Fish”, whose interpretation and production were confided to different craftspersons. In a series of interviews, Muriel Prouet and Grégoire Talon go back over the expertise and creative daring of these craftspersons (a cabinet-maker; a creator of textile art and embroidery; an embosser, printer and shaper of velvet; a master glass-maker; a master pleater; a mosaic artist; a sculptor of metal; and a sculptor of stone) as well as their collaboration with Clément Cogitore. Palais Issue 27The product (Reference ) is not presently in stock. Palais Issue 26The product (Reference ) is not presently in stock. 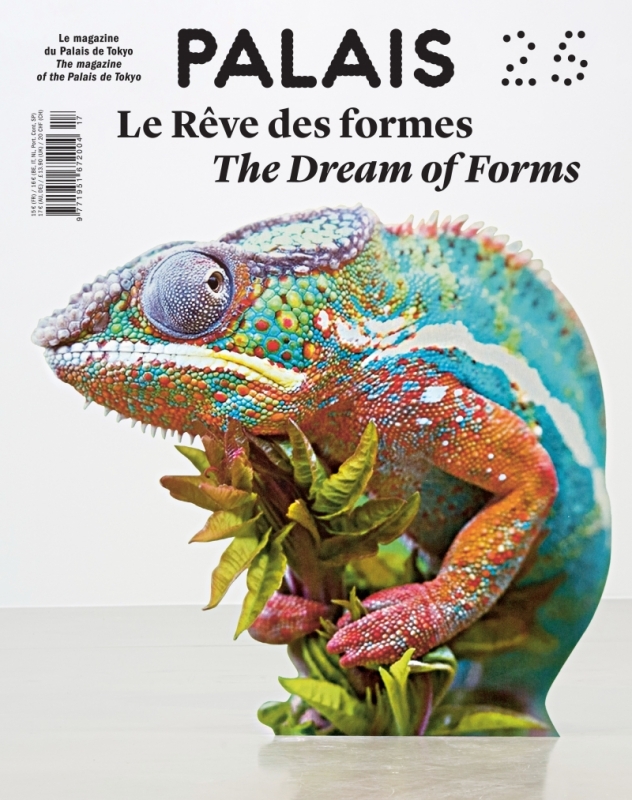 The magazine PALAIS is devoting its issue # 25 to the exhibition “Le Rêve des formes” [The Dream of Forms], presented at the Palais de Tokyo from 14 June to 10 September 2017, and organised on the occasion of the twentieth birthday of Le Fresnoy – Studio National des Arts Contemporains. The exhibition “Le Rêve des formes” has been conceived as an imaginary landscape, a monstrous garden cultivating perishable forms, germinating surfaces, and protuberant organisms. With a good forty artists and scientists, the show has been designed along two routes: on the one hand, the rediscovery of the world of the living in all of its diversity, through an exploration of dynamic, mimetic or naturalistic forms; on the other, an exploration of mutant or algorithmic forms, inspired by mathematics, computing and artificial intelligence. The exhibition “Le Rêve des formes” aims at questioning the meeting points between artistic and scientific research: how do today’s artists and scientists come up with original visual solutions, which help to reinvent the geometry of thought, outside familiar territories? The artist Anicka Yi is here in conversation with three biology researchers she recently worked with on the conception of new works. The composer Arnaud Petit explores how music creates a dialogue between words, writing and mathematics. The artist Hicham Berrada and the researcher Annick Lesne focus on moving, self-organised forms. 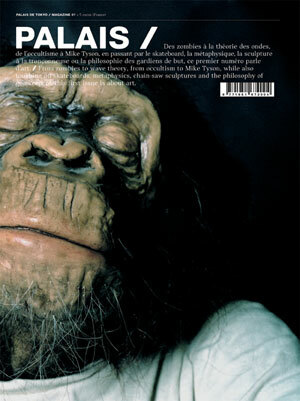 The stage director Jean-François Peyret and the neurobiologist Alain Prochiantz share their fascination in primates through a mischievous encyclopaedia. The artist SMITH and the cosmologist Jean-Philippe Uzan have imagined the history of a new humanity, on a quest for an organic link with the stars. Bertrand Dezoteux, in an animated film, has invented an interconnected world inspired from the research of the biologist Lynn Margulis into the arrival and development of life on earth. The literature researcher Marielle Macé is in conversation with Claire Moulène about the “forms of life.” In a “speculative fantasy,” the biologist, philosopher and science historian Donna Haraway imagines a symbiotic future between the various species on earth. Jens Hauser, exhibition curator and mediology researcher, analyses how, by adopting biotechnologies as a medium, artists have shaken up the relationship between art and life. The philosopher Fréderic Neyrat examines our humanism in an essay about transhumans, posthumans, androids and cyborgs. Palais Issue 25The product (Reference ) is not presently in stock. 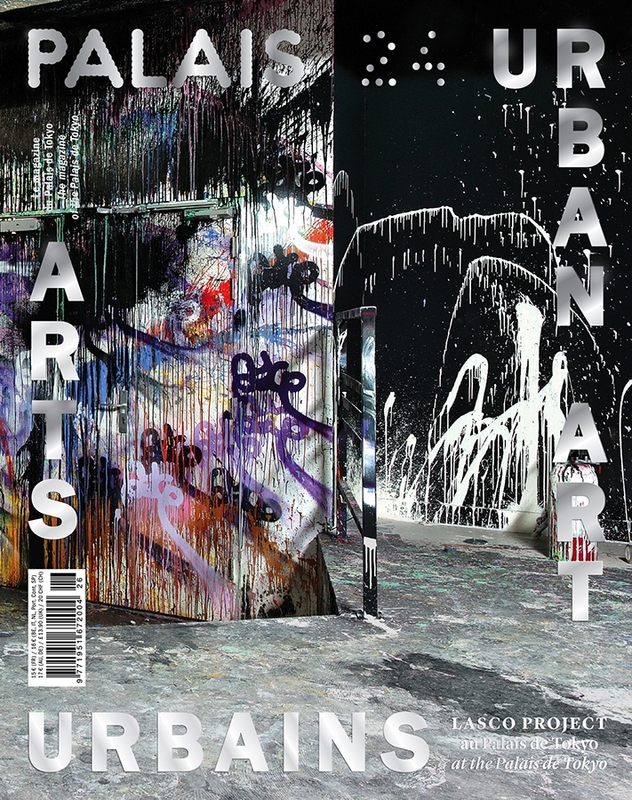 Around the Lasco Project, the Palais de Tokyo’s programme dedicated to urban art, PALAISmagazine is devoting its latest issue to artists whose work has been developed in the street. The Lasco Project was initiated in 2012, and stands as one of the most astonishing successions of urban art in a cultural site, reaching into the slightest nook and darkest cranny of the Palais de Tokyo. For it, almost sixty international artists have produced interventions, some of them monumental, others secret, which confront the Palais de Tokyo’s plain architecture, and infiltrate into its interstices. - An essay by François Chastanet drawing up a geography of urban signatures through a study of the contributions of the New York style of graffiti and the calligraphic inventions of Los Angeles and São Paulo graffiti. - “The Trapdoor,” a short story by Oscar Coop-Phane. - An essay by Jacob Kimvall on the complex relationships between artists practising graffiti or street art and public institutions. - A text by Hugo Vitrani introducing the Lasco Project. * As well as books for further reading selected by Nicolas Gzeley and Hugo Vitrani. Palais Issue 24The product (Reference ) is not presently in stock. 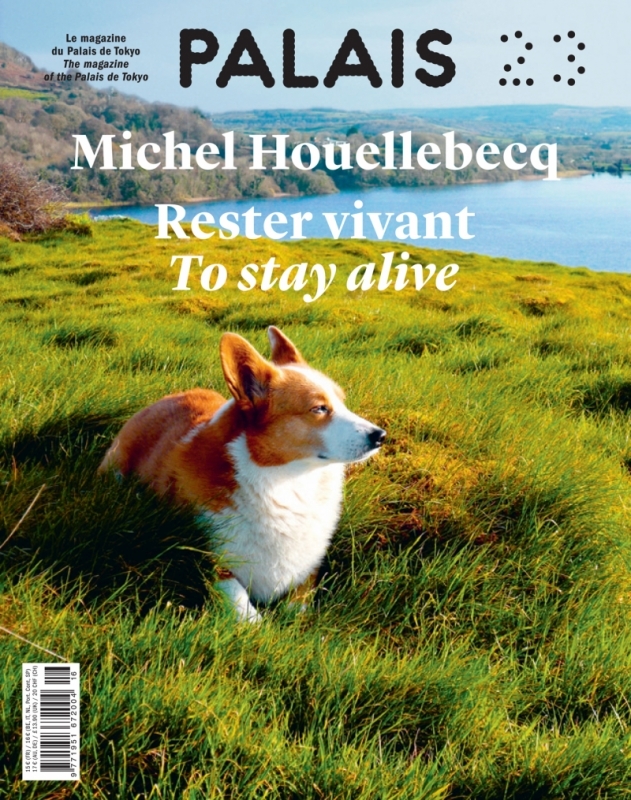 Issue 23 of PALAIS Magazine is entirely devoted to Michel Houellebecq’s exhibition “To Stay Alive,” presented at the Palais de Tokyo from 23 June to 12 September 2016. This is an exceptional event, because it is the first large-scale show devoted to Michel Houellebecq as an artist. This is also a special issue of PALAIS magazine with Michel Houellebecq as guest editor-in-chief. 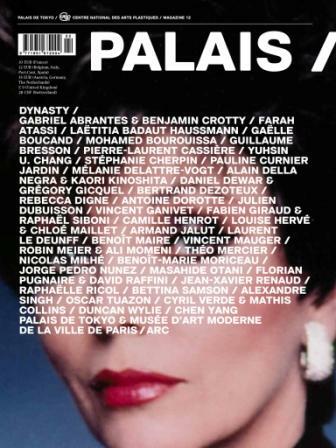 This issue of PALAIS magazine follows the organisation of the exhibition in chapters. Thanks to a series of unpublished interviews with Michel Houellebecq, a selection of his writings (essays, poems, novel extracts) and texts by guest authors, it provides a discovery of Houellebecq’s visual universe, and its intertwining with the many creative forms which the writer uses (music, cinema, performance…). Contents: photographs and a selection of texts by Michel Houellebecq as well as a series of interviews between Michel Houellebecq and Jean de Loisy, Yan Céh, Robert Combas (edited by Richard Leydier), Benoît Delépine, Nelly Kaprièlian, an essay by Stéphanie Moisdon and portfolios by Robert Combas, Marie-Pierre Gauthier and Renaud Marchand. Palais Issue 23The product (Reference ) is not presently in stock. Issue 22 of PALAIS magazine is entirely devoted to the Ugo Rondinone’s exhibition “I Love John Giorno” at the Palais de Tokyo (October 21, 2015 - January 10, 2016), the first retrospective of the life and work of the American poet John Giorno, a key figure of America’s counterculture since the 1960s. An iconic character in Andy Warhol’s early films, Giorno was influenced by Pop artists who opened his eyes to the idea of “found poetry,” and he captured the real-life colloquial language of advertisements, television, newspapers, and street slang. Seeking to create a new audience and a new relevance for poetry since the mid-1960s, Giorno has developed viral strategies to share poetry with as many people as possible. Whether recorded on albums or on an answering machine, silk-printed or painted on canvas, proclaimed on a stage or de-structured on the pages of a book, Giorno’s poems are images capable of limitless forms of technological reproduction. This issue of PALAIS magazine follows the organization of the exhibition in eight chapters, each standing for one facet of John Giorno’s multifarious work and life. 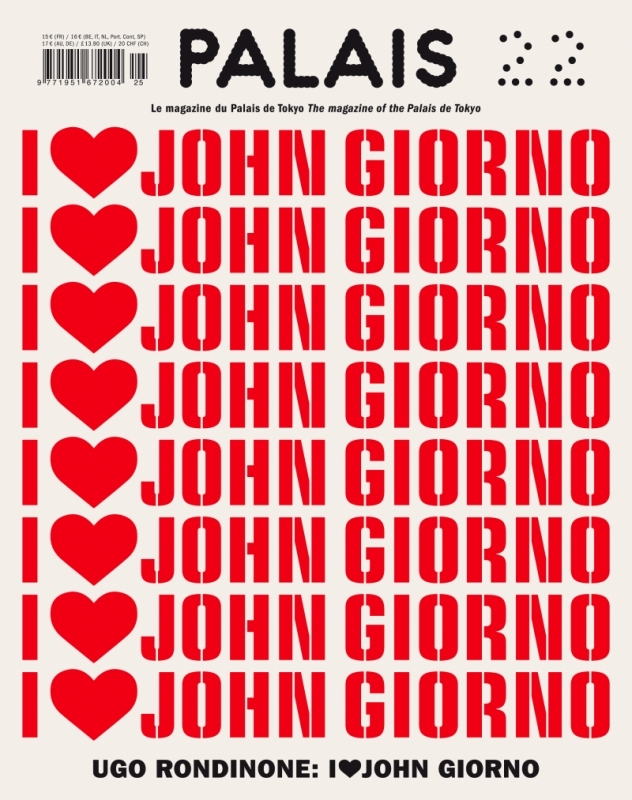 It includes a series of original contributions and artists’ testimonials, documents from John Giorno’s personal archives, and also a selection of John Giorno’s writings. With contributions by: John Giorno; Ugo Rondinone; Florence Ostende, the curator of the exhibition; Marcus Boon, Laura Hoptman, Daniel Kane and Jean-Jacques Lebel concerning John Giorno’s oeuvre; Bruce Jenkins on John Giorno and Andy Warhol; Marcia Bassett and Anastasia Clarke on John Giorno’s archives; Nathalie Bazin and Vivian Kurz on Tibetan Buddhism and its importance for John Giorno; Anne Collier and Matthew Higgs about Giorno Poetry Systems; as well as by Verne Dawson, Judith Eisler, Pierre Huygue, Françoise Janicot, Scott King, Gérard-Georges Lemaire, Elizabeth Peyton, Michael Stipe, Billy Sullivan, Rirkrit Tiravanija. PALAIS issue 22The product (Reference ) is not presently in stock. 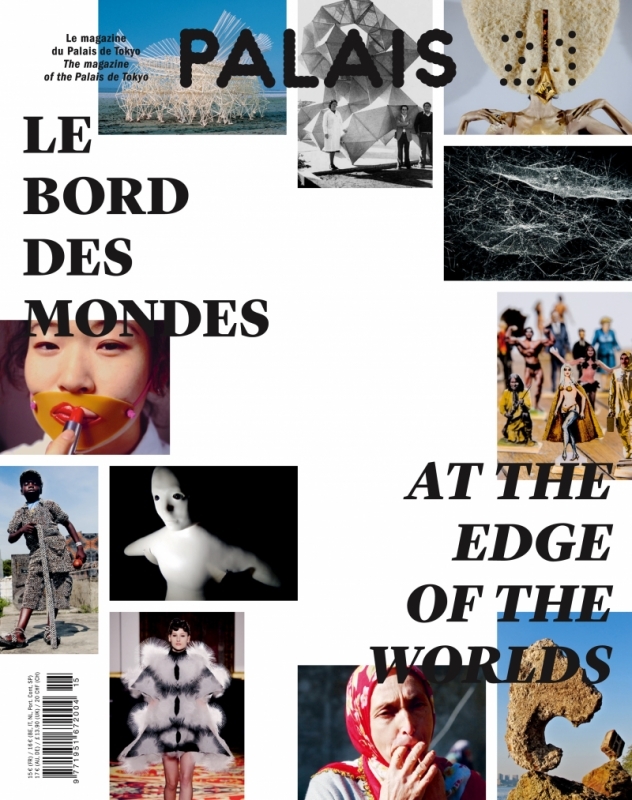 Issue #21 of PALAIS is entirely devoted to the exhibition “Le Bord des mondes” [“At the Edge of the Worlds”] at the Palais de Tokyo (February-May 2015). By exploring territories that lie outside the art world and bringing to light unique gestures that give way to new forms of creation, the exhibition “Le Bord des mondes” aims to renew and expand the field of our artistic attentiveness in an attempt to see, experience and conceptualize the world by liberating ourselves from the categories that order it. The curator of “Le Bord des mondes”, Rebecca Lamarche-Vadel, presents the stakes at the heart of the exhibition and invites readers to discover the research undertaken by these creators, which goes beyond the classic definitions of art. Jean-Marie Schaeffer, philosopher, presents a view which runs counter to a position that seeks to oppose art and everything that is not art. He considers art to be a plural world which is constantly redefining its reach and nature through its interactions and exchanges with the multiple worlds that border it. David Raymond, artist, writer and poet, examines Bridget Polk’s “balancing rock” installations; Laurent Derobert, inventor of “existential mathematics,” discusses the relationship between math, art and love with the mathematician Edward Frenkel and the artist Peter Coffin; Philippe Rekacewicz, geographer, cartographer and journalist, guides us in the perusal of a map to an imaginary world invented by Jerry Gretzinger; Sandra Maunac, curator, retraces the history of Kinshasa Sape, while revealing its close connections with the city’s music scene; Hiroshi Ishiguro, who creates “geminoid” robots, talks with composer Keiichiro Shibuya, author of an opera written for the vocal synthesizer software Vocaloid; with his “beach creatures” able to move and survive autonomously, Theo Jansen throws our anthropocentrism into fresh perspective; Frédérique Aït Touati, a literature and science history researcher and stage director, dives into the heart of Tomás Saraceno’s spider webs; the food essayist Bénédict Beaugé supplies an in-depth analysis of one of Pierre Gagnaire’s dishes; Jean-Paul Thibeau, artist-researcher, tells about his meeting with Jean Katambayi, an artist-hacker-DIYer; Jane Venis, sculptor and writer, offers a study on the founding principles of chindogu, weird objects invented by Kenji Kawakami. PALAIS issue 21The product (Reference ) is not presently in stock. PALAIS issue 20The product (Reference ) is not presently in stock. 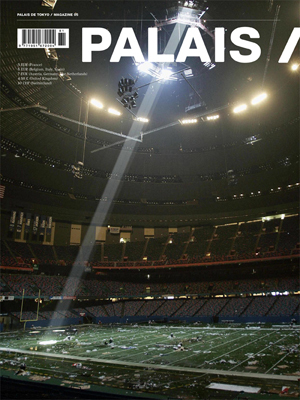 Chiming with “L’État du ciel” [The Sky’s State], the new season of exhibitions at the Palais de Tokyo, from February to September 2014, this issue of the magazine PALAIS brings together contributions by a large number of artists, writers, critics and researchers. An essay by Hiroshi Sugimoto, the great Japanese photography master and collector, who confronts and conjugates Japanese thought and culture with Western ideas and art. A choice of writings by Thomas Hirschhorn, published in their original language, which testify to the need for the artist to define his own terms and affirm his position. An unpublished text by the British artist Ed Atkins, in relation with one of his new pieces. “New Ghost Stories”: in texts and images, Georges Didi-Huberman, philosopher and historian, and Arno Gisinger, artist, explore the historical and theoretical concerns in their common exhibition project and the question of the montage of images as specific forms of knowledge about the world. 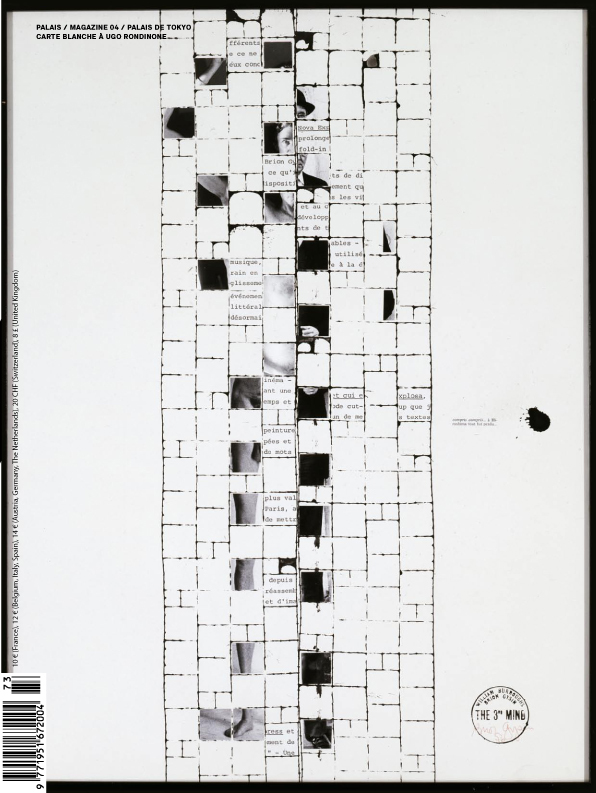 “Little Illustrated Dictionary of the Fall”: under the editorial lead of Marie de Brugerolle and Gérard Wajcman, nine authors (artists, writers, psychoanalysts, filmmakers, etc.) have been asked to contribute to a series of variations on the figure of the fall. Jeanne Truong, writer, concerning the recent artistic work of Angelika Markul. David Douard in conversation with Stef Aupers, the cultural sociologist, about his exhibition at the Palais de Tokyo and the ambivalences of contemporary subjectivity. 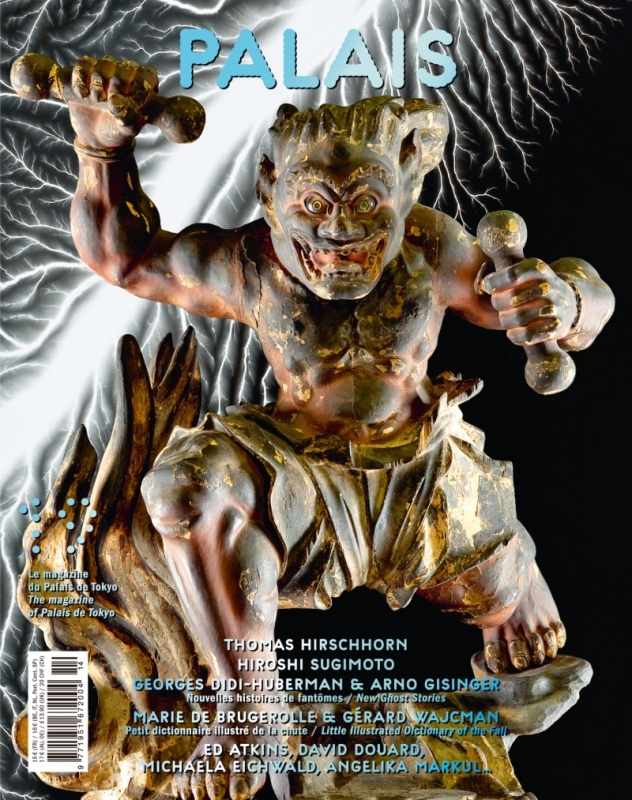 Minoru Shimizu, the art critic, analyses the possible links between the photographic works of Hiroshi Sugimoto and the artist’s projects in the field of the traditional performing arts. Sébastien Faucon and Agnès Violeau take a look at the issues involved in the exhibiting ofprotocol, performance and relational based works. A focus on four artists from the emerging scene: Alessandro Piangiamore, Vivien Roubaud, Thomas Teurlai and Tatiana Wolska. Michaela Eichwald; Michael Riedel; the 2013-2014 residents of the Pavillon Neuflize OBC, the creation laboratory of the Palais de Tokyo. PALAIS Issue 19The product (Reference ) is not presently in stock. In this issue: contributions of young curators presenting their exhibition at the Palais de Tokyo and in Parisian galleries and art spaces, as well as the issue 7 ½ of the journal The Exhibitionist. 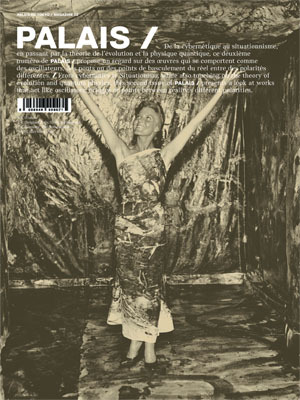 Published at the occasion of “Nouvelles vagues”, the 2013 summer season of the Palais de Tokyo, this issue of PALAIS underlines the importance of the recently defined curator figure and sheds light upon current exhibition practices developed by the latter. This figure, which emerged in the context of a general questioning of the artistic institutions in the 1960s, has now become inseparable of a reinterpretation of art history through the prism of the exhibition as a medium. In order to testify about this transformation in the art ecosystem, the Palais de Tokyo presents the projects of 21 young curators or curator groups (of 13 different nationalities) selected after an international call for proposals, and leads along 32 galleries and art spaces all over Paris. 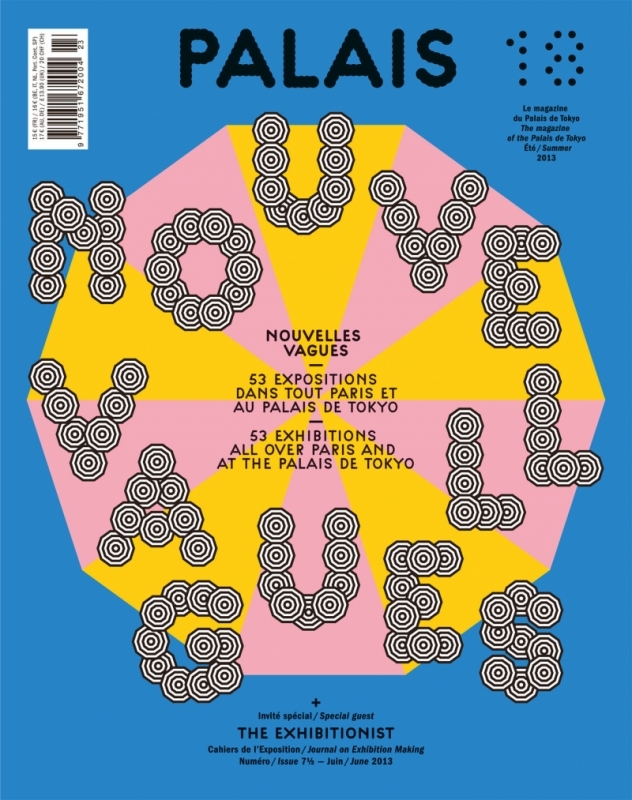 The magazine PALAIS devotes its issue #18 to the 53 exhibitions that constitute “Nouvelles Vagues,” including original contributions by the young curators invited by the Palais de Tokyo and the Parisian galleries. 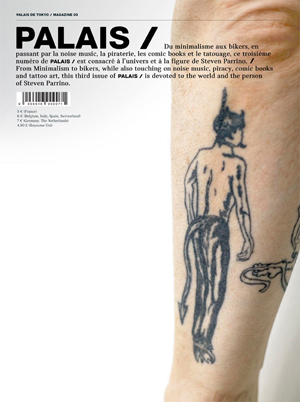 Special guest for this issue: The Exhibitionist, an American journal on curatorial practices and exhibition making, offers a subjective exhibition history through six peculiar examples, in both English and French, covering 70 pages to be discovered inside PALAIS magazine. PALAIS Issue 18The product (Reference ) is not presently in stock. Echoing the Palais de Tokyo’s new season, this issue of PALAIS is infused with the poetic genius of Raymond Roussel, great explorer of invented worlds, causing us constantly to topple over into a different mental geometry. Contents of this issue: essays by Matthieu Poirier on Julio Le Parc, Niklas Maak on François Curlet, Dieter Roelstraete and Yann Chateigné Tytelman on recent works by Joachim Koester, Amélie Lavin on Dewar & Gicquel; visual contributions by Takahiro Iwasaki and Evariste Richer; a focus on seven artists from the emerging contemporary scene (Marcos Avila Forero, Hicham Berrada, Gauthier Leroy, Lars Morell, Jean-Michel Pancin, Pierre Paulin, Clémence Seilles); under the heading “Hell as discussion,” Nadja Argyropoulou, curator, and Yorgos Tzirtzilakis, architect, discuss Greece’s “demonization” as a symptom of the European crisis. PALAIS also invites François Piron, curator of the exhibition “New Impressions of Raymond Roussel,” to create a dossier in dialogue with this venture. In it, he comments on the writer’s whimsical personality and on his mysterious work in which, as Roussel stated, “Nothing real must enter.” Accompanied by historians, by art critics and artists, Piron approaches the topic diagonally to consider the propagation of Roussel’s work through that of many artists. 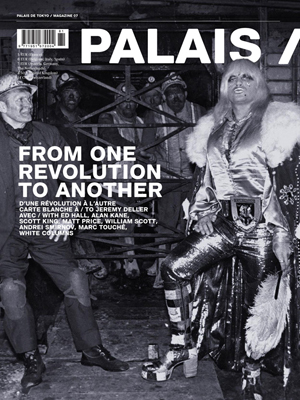 PALAIS Issue 17The product (Reference ) is not presently in stock. Following the development of an artist’s thought, witnessing the circumstances of his creativity, discerning the interval separating an idea from its execution, seeing the artist become accustomed to his own discoveries… Closely following the creative process, this latest issue of PALAIS magazine is given over to the artists’ own words, presented in a variety of formats, echoing the exhibition program of the Palais de Tokyo. 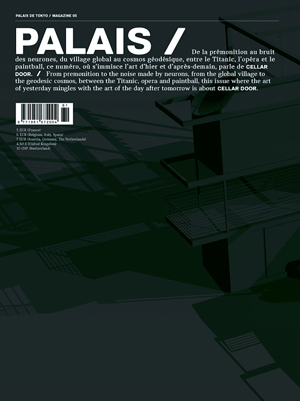 Contents of this issue: Croatian artist Damir Očko speaks to the art historian Daniele Balit; Fabrice Hyber converses with Théo Mercier, Pierre Giquel, Pascal Rousseau and Jacqueline Frydman; a focus on eight artists from the emerging contemporary art scene (Iván Argote, Tjorg Douglas Beer, Jonathan Binet, Maxime Chanson, Mimosa Échard, Thierry Liegeois, Éponine Momenceau and Henrik Potter); an essay on Neïl Beloufa by the art critic Gaël Charbau and on Alexandre Kojève by the art historian Boris Groys; inserts, projects and visuals contributed by Helen Marten, Ryan Gander, Christian Marclay and the artists of the Pavillon; Alexis Vaillant visits Markus Schinwald’s studio. PALAIS has also invited the art critic and theorist Jill Gasparina to create a dossier that enters into dialogue with the exhibition “Imagination Adrift.” Inscribing the modern poetics of chance into a wider history of technologies and rationalization techniques, she outlines a complex history of the taming of chance in which relationships of authority, control procedures and emancipatory tactics combine. Dossier edited by Jill Gasparina, with texts by Stewart Brand, Dunne & Raby, Éric Duyckaerts, Vilém Flusser, Holis Frampton, Jill Gasparina, Liam Gillick, Melanie Gilligan, André Gorz, Adam Greenfield, Boris Groys, Oliver Laric, Nathaniel Mellors, John Miller, Tony Oursler, Eli Pariser, David Robbins, Pierre Vadi, Camiel van Winkel. PALAIS Issue 16The product (Reference ) is not presently in stock. 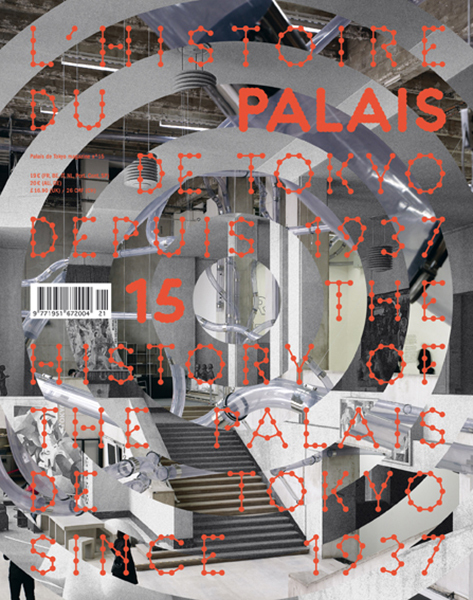 Special issue : the history of the Palais de Tokyo from 1937 to today, and until tomorrow. The magazine PALAIS, in the inaugural issue of its new formula, tells the story of this epic adventure in texts and images. Through several testimonials, interviews and multiple unpublished documents, it invites you to discover over seventy years of artistic life within the Palais de Tokyo. 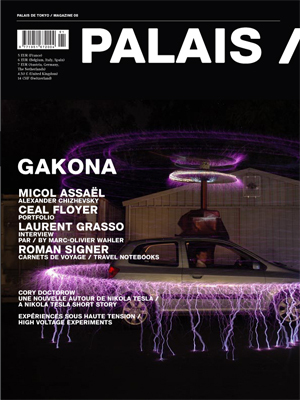 Palais NÂ°15 - special issueThe product (Reference ) is not presently in stock. PALAIS / let people see contemporary art in an up-to-the-minute, complex-free way, as often as possible from the point of view of the artists themselves. Every quarter, PALAIS / outlines the artistic universe of the Palais de Tokyo's program and invites many contributions from diverse fields: it features the artists presented at the Palais de Tokyo, portfolios as well as texts by art critics or philosophers, writers, artists, etc, and a guide section related to the exhibitions. PALAIS NÂ°14The product (Reference ) is not presently in stock. PALAIS NÂ°13The product (Reference ) is not presently in stock. PALAIS NÂ°12 -02The product (Reference ) is not presently in stock. PALAIS NÂ°12 -01The product (Reference ) is not presently in stock. 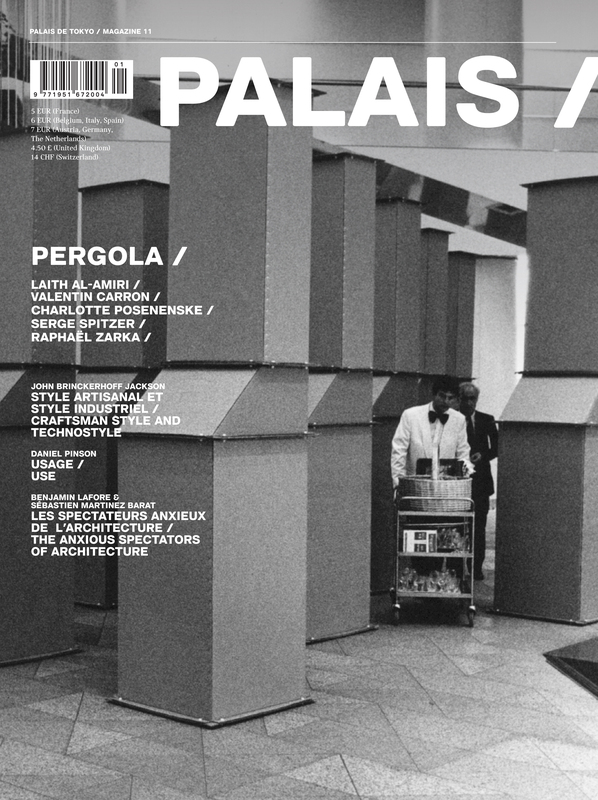 PALAIS / NÂ°11 - PERGOLAThe product (Reference ) is not presently in stock. 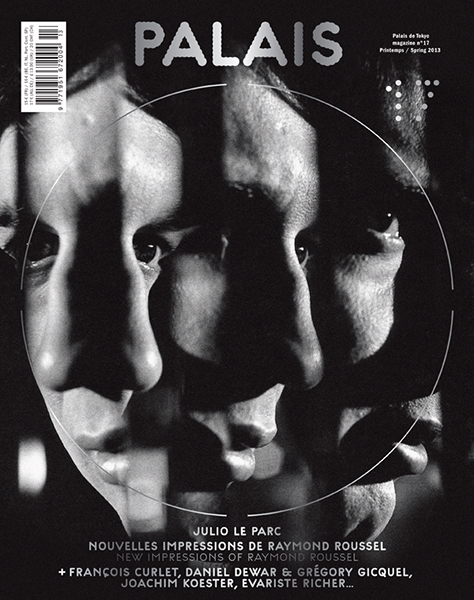 Order the latest issue and complete your collection with these back issues of PALAIS /. 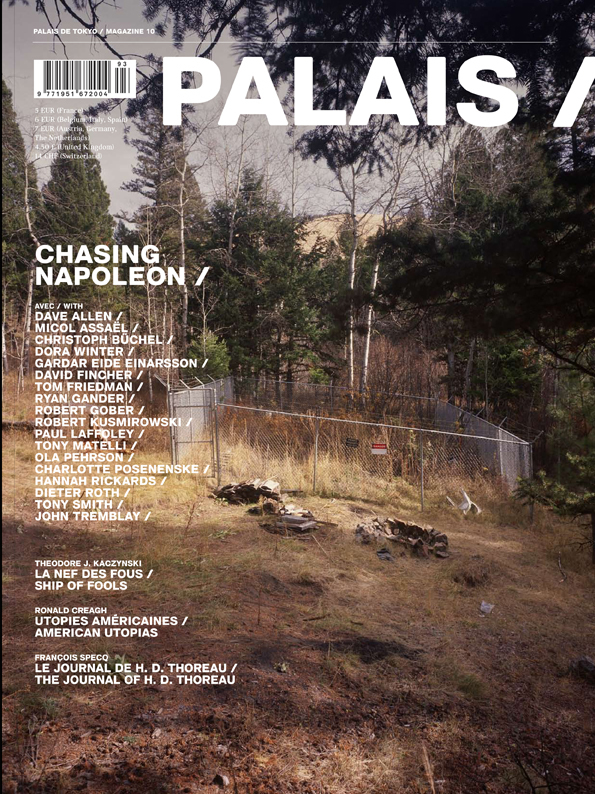 PALAIS / NÂ°10 - CHASING NAPOLEONThe product (Reference ) is not presently in stock. 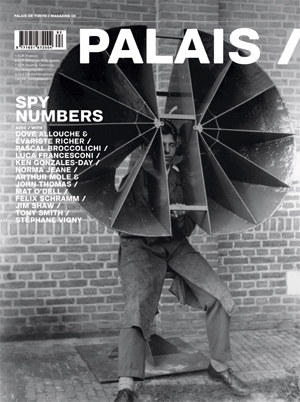 PALAIS / NÂ°9 - SPY NUMBERSThe product (Reference ) is not presently in stock. PALAIS / NÂ°8 - GAKONAThe product (Reference ) is not presently in stock. PALAIS / NÂ°7 - FROM ONE REVOLUTION TO ANOTHERThe product (Reference ) is not presently in stock. PALAIS / NÂ°6 - SUPERDOMEThe product (Reference ) is not presently in stock. PALAIS / NÂ°5 - CELLAR DOORThe product (Reference ) is not presently in stock. PALAIS NÂ°4The product (Reference ) is not presently in stock. PALAIS / NÂ°3 - LA MARQUE NOIREThe product (Reference ) is not presently in stock. PALAIS / NÂ°2 - M, NEWS FROM THE UPSIDE DOWNThe product (Reference ) is not presently in stock. PALAIS / NÂ°1 - FIVE BILLION YEARSThe product (Reference ) is not presently in stock.